Google's Nexus One smartphone debuted in January to good press, good reviews -- and poor sales. (CNN) -- With the eyes of the technology world squarely on Apple's iPhone 4, Google quietly announced it will stop selling the Nexus One, its first and possibly only foray into the smartphone world. In a two-paragraph post on its official blog, Google's Nexus One team said the next shipment of the phones will be the last. 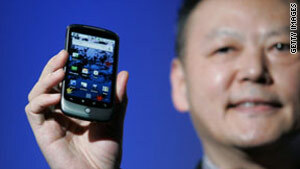 "Once we sell these devices, the Nexus One will no longer be available online from Google," according to the post. The announcement was made Friday, the same day that Apple CEO Steve Jobs held a news conference to announce the company's solution for reception problems with the popular iPhone 4. Running on Google's Android operating system, the Nexus One was released in January to mostly positive reviews from the tech blogosphere. Early users compared it favorably to the iPhone and liked the ability to buy the phone, albeit for more money, without a data plan from a particular service provider. But sales were anemic, with the phone selling only 135,000 units in roughly the same time it took the iPhone and the Droid -- Motorola's phone that runs the Android system -- to sell 1 million. Many blamed Google's experimental try at selling the Nexus One only in its online store. The company abandoned that approach in May, offering the phone in brick-and-mortar stores for the first time. With the announcement, Google seems satisfied to write off the Nexus One as a tool to experiment with Android's features. Recently, the search engine giant has been pushing Android users to phones made by other manufacturers, such as the HTC Droid Incredible. May's announcement mentioned both the Incredible, for Verizon customers, and the HTC Evo 4G from Sprint as phones that have benefited from advances made on the Nexus One. The new Droid X from Motorola has most of the Android buzz now. It was released last week to positive reviews and is selling out online and in many retail stores. Google's blog post said that it will continue to make the Nexus One available to Android developers so they have something to use while writing apps for the mobile platform.